It’s noted that Luxchem Corp. has 2 segment divisions, namely trading and manufacturing. With the recent drop in crude oil price, it prompt me to look at some sectors that will benefit from the decline in oil price. Obviously, Luxchem is one of them. Luxchem does not manufacture nitrile, it sources the chemical from Zeon Chemicals of Japan and supplies nitrile to glove producers. I do not have any info of any local competitors who supply the same chemical to the industry and also which glove producers are their customers. However, Kossan for sure is one of them due to their close relationship. For its trading department, the management once said that their product selling price depends on the material price they bought plus certain margin. When the raw material price changes, they can adjust the selling price of their products. But to me, said is easier than done, it’s not easy to transfer the cost to the customers especially when competition takes place. I tried to find some linkage between crude oil price, USD/MYR rate and Luxchem’s sales for the past few years. 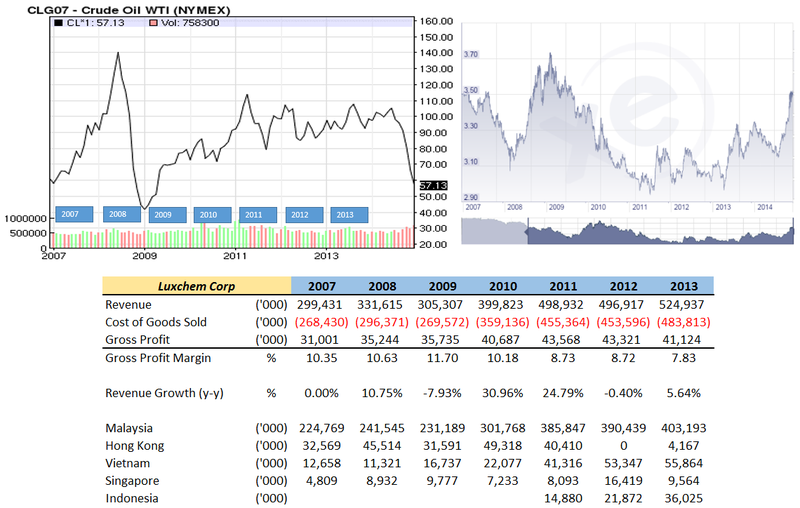 Below are historical price chart and Luxchem data. Financial year of Luxchem is at the end of December. Year 2008: Crude oil price started the year at USD90, up till USD140 at mid before crushed to USD45 at the end of year. USD increased from 3.10 to 3.7 peak. Revenue increased 10% compared to year 2007. Year 2009: Crude oil price started the year at low USD45 and rebounded to USD70 before moving up gradually to USD75-80. USD dropped 3.7 to 3.2. However, revenue was down closed to 8%. Year 2010: Crude oil price was quite stablished, hovering between USD70 to USD90. USD dropped from 3.3 to 3.05. Revenue up 31% with sales from local increased tremendously. Year 2011: Crude oil price was little bit fluctuating, gone up to USD115 from USD95 in the beginning of year, then dropped back to USD80 before end the year at around USD100. USD stabilising around 3.0. Revenue up around 25% with sales mainly from local. Year 2012 & 2013: Crude oil price was stabilising and forming a convergence between USD88 and USD108. USD stabilising around 3.1 before moving up to 3. 3 at year end. Revenue for 2012 & 2013 remained flat. The relation is not that direct since it still involved other factors (Sales growth, new markets etc). But one thing for sure is the gross profit margin is in declining mode throughout the years. Up to Q3FY2014 this year, the gross profit margin dropped to around 7.1%. When breakdown into segments, the operating profit margin of the trading segment was declining. Perhaps the group locked down or signed mid term contract with the suppliers/customers for a certain fix price. I have really no idea about that. For the manufacturing department, raw materials such as petroleum based styrene monomer and glycol are used to manufacture unsaturated polyester resins (UPR) and they are subjected to oil price. Above operating profit data were taken on external sales which eliminate the inter segment sales. For manufacturing segment, it’s easier to observe the effect of the crude oil price changes. Operating profit margin was at the highest at year 2009 & 2010 when the oil price was in USD42 (beginning of 2009) to USD90 (end of 2010) per barrel while USD also dropping from USD3.70 (beginning of 2009) to USD 3.10 (end of 2010). Both work in favour for the segment. For year 2011-2013, the gradual increase in USD currency rate and crude oil price cause the operating profit margin dropped to around averagely 10%. Moving forward, the crude oil price may not have much significant effect on the trading department, albeit I foresee their operating profit margin will keep on declining. Perhaps, will we see the return of 15-20% operating profit margin from the manufacturing segment next few quarters? The increase production capacity in year 2014 may help too. So, perhaps Luxchem, a good buy? 哇！那么 ”串“ 的IR！上AGM 投诉那个IR ...!